I understand Nihal is trying to ‘debate’, but his show’s are largely intellectually vacuous and he panders to his more traditional listeners. He displays this quite clearly when he doesn’t know how Trotsky and Lenin have been held in a ‘holy’ vein yet has a strong opinion on it. He is also representative of a lot of people ‘offended’ by TSV, offended without seemingly having read the book or knowing if any of its contents, just simply aware that is controversial. I don’t quite get when he says “is it your fundamental misunderstanding of how the Prophet is regarded”, he seems to be missing the point entirely. The question is, does Nihal have a fundamental misunderstanding of what freedom of expression means and also what it means to live in a pluralistic society. The whole idea of something being ‘sacred’ really gets in the way of having a rational conversation. TSV is a very complex book that should be engaged with on that level, not just to call having written it for ‘the sake of art’…it’s well and truly a masterpiece of literature and it’s quite easy to forget the book isn’t even about Islam. It does have segments that cleverly re-imagines and re-questions a religion like Islam, but I think it is a book first and foremost about London and immigration. I have never liked the Asian Network as it promotes the homogenising of South-East Asian cultures and doesn’t see encourage the view that cultural hybridity in the west is a positive force. I don’t buy into their promotion that they are the voice of ‘Asian Britain’, my parents are from North-East India and doesn’t represent their culture in any way whatsoever. The point being that Indian culture is too rich and diverse it is impossible to represent but has created a bastardised version. As for here, the increasing plurality of the British Asian identity means that it has no relevance for millions. It can be at times incredibly traditionalist and counterproductive due to it’s intellectual vacuousness, shame the beeb decided to keep the network for now. Well I am very impressed with K.M’s gift of the gab, he comes up with good clear answers on the spot just as he does on this blog. But I feel he missed one of the bigger points: the burden of proof should not be upon the speaker. Nihal keeps wanting K.M. to explain to justify The Satanic Verses, but apart from what is needed to convince anyone it is worth investing in, the writer needs no justification. Time and again Nihal asks “where’s the progress in TSV”. Now I think every page of Rushdie that I have ever read is a _regress_ for the English language. And so I put his books down and insult him when I come across his fans. But he can continue to sell to those fans, because he answers only to them, not to me, or to Nihal or the Ayatollahs of Iran. Sorry Alfred, the above comment was irrelevant to yours, I didn’t mean it to be a “reply”. For what it is worth, I didn’t even know about the Asian Network until I left London and started living in Germany. But I am Australian, so “Asian Britain” can define itself however it likes as far as I am concerned. But the Asian Network does confirm my assumption that “Asian Britain” means “a bunch of former Indians and Pakistani’s with strange accents”. It always amazes me how touchy religious believers are about their sacred icons. Anyone could invent a belief and claim something is beyond criticism. Why should someone who doesn’t share those beliefs be prevented from expressing their own thoughts and ideas on the subject? Are these religions so fragile that they cannot withstand this? If we take things to extremes, if there were more and varied religions, and we had to respect the beliefs of everyone and not cause offence, what kind of public debate would then be possible? We would forever be checking our thoughts for fear of being accused of blasphemy. Nihal’s arguments are thoroughly cringeworthy and predictable. I agree with Alfred Ahmed’s comment. 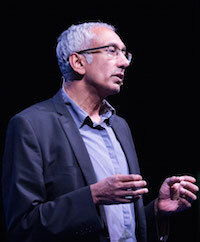 Nihal’s shows are unintellectual and regularly pander to traditional and surface discussions of important topics. Take, for example, the discussion on whether non Asian men treat Asian women better. http://theopinionista.com/2012/02/10/do-you-think-asian-women-are-treated-better-by-non-asian-men/ Well done for not backing down Kenan. I would not be so hard on Nihal – he is, after all, performing a role – though he probably does genuinely believe in much of what he was arguing. I agree, though, with the concerns about the BBC’s Asian Network and the idea of ‘Asian culture’ that it insidiously promotes. Kenan, I must spend more time on your blogs! The first one I came across was ‘The Poetry of an Old Atheist’ and, I have used al-Ma’arri’s writings on many occasions and they are particularly pertinent because it all happened before the Crusades. Which in itself is pertinent because of the comment made by one of the contributors to Nihal’s programme who stated that it was wrong to spread religion at the point of a gun – a case, perhaps, of a potential repeat of history. To put a bit of flesh on the bones of the Rushdie argument, I retired from the Police service in 1993 having spent the last ten years of my service, in a supervisory mode, in South Leeds, which is where one of the 7/7 crowd lived and the remainder carried out their planning; although that was many years after my retirement. One Saturday I had to take a contingent of Police officers to Bradford for the anti-Rushdie protest march. Our primary brief was to meander amongst the gathering throng of protesters and gently advise them that if they marched carrying banners bearing any legend suggesting that Rushdie should be killed there was a better than even chance they would be arrested – making threats to kill carries a two year prison sentence in GB. There were no objections. Incidentally the vast majority of the marchers, which numbered in total around 500, were bused in, and had been handed the banners in question when they alighted from their transport. Most had never heard of the Satanic Verses and not one had read the book or even seen it. I had an Asian officer with me and he spoke three Asian languages, far more than most of the young men who participated. In the end, intelligence from my officer and a carefully coralled procession resulted in a pleasant stroll aorund the outskirts of the Braford city centre which passed off without incident. I found out a few days later that the march had been organised by an Iranian who had specifically flown in via the Gulf with a view to creating forment amongst the Asian community in the UK. Special Branch had been advised by the security services and his progress had been monitored – you can imagine the information they accrued!